Knowing how to create and stick to a realistic budget is the foundation of successfully managing your money. L et your kids learn the secrets of budgeting at an early age. This month’s goal: Talk to your kids about budgeting and give them the tools they need to create their own budgets and stick to them. 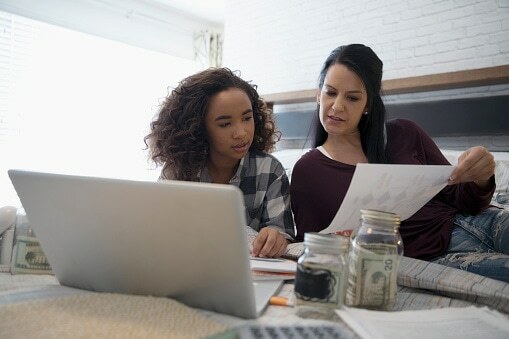 Have younger kids create a budget for their own money and expenses over the course of a month, and have older kids try their hand at creating a realistic monthly budget for your family. Can you think of different kinds of things that mom and/or dad need to pay for every single month? Imagine I gave you $50 to spend at the toy store. Would it be smart to plan what you want to buy before you walk into the store or just to go in and see what you want to buy? Why do you think so? Planning how to spend our money helps us spend it more carefully. Why do you think we want to be careful about how our money is spent? A monthly budget is a way of tracking income and expenses. Why do you think this is important? Did you ever overspend because you hadn’t planned well? Can you think of different categories that might be included in a monthly budget for a family of our size? Do you think it’s possible to plan for everything that happens in life? Why or why not?